Amongst the classic Littmann models, this one is simplest and least expensive. It is also among the best selling products of the Littmann series. It is used by many practitioners as a model to start their career and is also highly popular among the nursing and medical students as well as novice professionals. 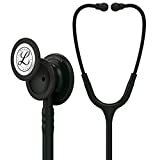 Its chest piece comes with a conventional bell and a tunable double-frequency diaphragm, like other Littmann stethoscopes. This is the perfect model if you have set a limited budget to start with. You can be assured of a reliable and durable performance, although its audio performance could be improved.